Six times stylish.. 'the lady in the houndstooth check suit'..
Where did the month of May go? The expression 'time flies by in the wink of an eye' is apt! On Saturday the skies were blue and the day warm. The clink of teacups and the chatter of ladies gathered together to raise money for a worthy cause could only mean one thing.. Australia's biggest morning tea. You've been to Jenny's afternoon tea here before, it's an elegant affair with it's mix of attending 'Royals'.. Doulton and Albert that is :) raising funds in this way is a stylish notion.. and then there was the lady in the houndstooth check suit, hand made she told me.. j'adore! It's WA Day today, a long weekend.. I'm looking forward to catching up on stylish posts around the world. Happy Monday, take care and stay safe..
'That's how we (sushi) roll'..
Iku Sushi, 'that's how we roll'. Free lunch delivery.. a handy service for city workers who are chained to their desks :) Just one of the excellent eateries in Globe Lane, 140Perth on William St. Oh the temptations Aimee has to face each day as she heads into work, she has more will-power than I! So what's up CDP'ers out there.. are you all prepared for the 'stylish' theme on the 1st June? I picked the subject and as of this moment I have rien, niente, zilch, zero, bugger all and nuttin'.. I'd better get my skates on, who knew we were almost over May already :) Bon weekend, take care and have fun! Australian artist Peter Drew is on a mission! A three month road trip around Australia to put up 1,000 'Real Australians Say Welcome' posters supporting asylum seekers. Read about the different reactions he's had along the way here. It's a complex subject, understatement of the year, I can't imagine what it would be like having nowhere to call home, at the same time knowing that no country really wants you. Drew picked a good spot here, Doogues Lucky Lotteries on Murray St in the city is Perth's oldest and well frequented news-agencies. I threw in the shot below because, well just because :) Happy Friday, take care and stay safe.. Looking down into Forrest Place it was comforting to see that amidst the 90% of people talking or texting on their mobile phones, two gentlemen were engaged in a long and animated conversation.. hope! Happy Thursday, take care and stay safe..
A 'stylish' stinky memento from the past! Alerted by a story I read in the newspaper I went on the hunt for possibly the strangest subject for the blog to date! Who would have thought there was something with an unsavoury past lurking on this leafy, tree lined street in Northbridge. 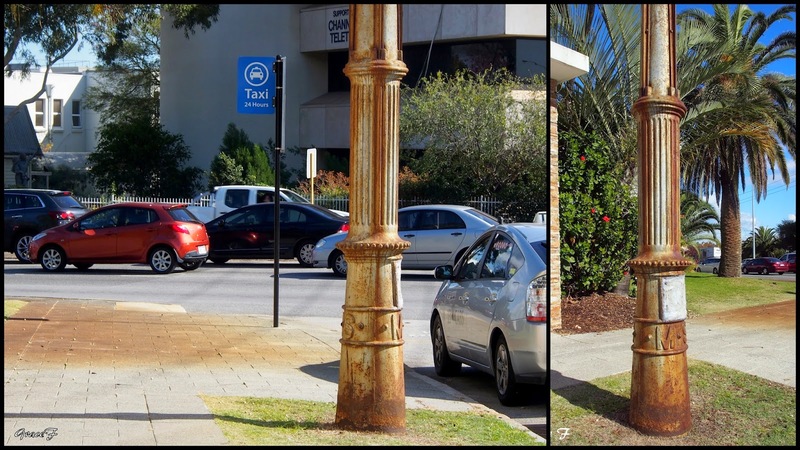 Dated between 1911 - 1930 there are nine 15mtr tall pipes referred to as 'stink pipes' because their purpose was to dispel noxious odours from the sewerage system scattered around the city. I cannot believe how many times I must have passed these vents without giving them a second glance. One of the more unusual mementos of the history of Perth to be included in the State Register of Heritage Places. Don't know how this one on the corner of Cook and Loftus has escaped my eagle eye! The pipes which may be modeled on English sewer gas lamps, have decorative circular ornate cast iron bases with fluting and moulding containing the letters M S (Metropolitan Sewerage). Despite their function I think the decommissioned pipes are rather a charming reminder of the past. You can't say I don't give you variety :) :) Happy Wednesday, take care and stay safe.. The entrance to Chinatown through the Old Shangai food court off James Street, the gate I showed on Wednesday was off Roe St. These shots are straight out of the camera without any added saturation at all, Northbridge (check it out) really is this colourful, in many ways, at night! Hope you had/are having a fab weekend, take care and stay safe..
Greek Orthodox Church, West Perth.. Walking up Roe St. in Northbridge I took this shot of the Horseshoe Bridge reflected in the State Theatre Centre. I love the way the bridge sweeps over into the city and am prepared to chain myself to it to save it if there is ever even a hint of it being removed in the name of progress :) See that little slither of a reflection in the middle of the road above, it's a puddle reflection.. those of you living in the northern hemisphere might not understand why this is so exciting, but here in Perth it's been a while since we've had the opportunity to take puddle pictures :) Let the rain continue! Bon weekend, take care and stay safe.. There are a lot of eating venues around Perth that have become so popular they don't take bookings, you take your chances and know that you might have to wait for a table to clear. It's a bit like that in Café de Grâce.. best seed selection in town :) Early morning yesterday it was all about the Little Corellas. Although mainly white in colour they have a distinctive red patch on the face along with the vibrant blue around the eye and a pale yellow under their wings.. It's interesting to watch when there's a big group like this, some are prepared to wait patiently, while others when they feel fellow diners are taking too long get a wee bit grumpy, that would be moi :) It's getting a little chilly in the morning and evening here in Perth, winter is on the way. Have a fab Friday, take care and stay safe.. Bit of an arty shot today :) When space is short.. there's always the window ledge, brilliant! Seen when brunching at Mrs S in Maylands. Even better, this spot can be used from inside and out.. now that's making the most of every available space and when the poached eggs are soft and perfect as above, the people will come :) Happy Thursday, take care and stay safe.. The entrance to Chinatown off Roe Street has been (t)arted up during FormPUBLIC 2015 by Sydney based artist, and so much more, Brett Chan who believes 'if maths is the language of the universe, then geometry is a visual representation of that voice'. Excellent! Happy Wednesday, take care and stay safe..
Way to brighten up a dull day or.. up, down and the other side! Firstly I'd like to say thanks for all the feedback yesterday, after a few technical issues I think I'm coming to terms with the change over to desk top, and as many of you pointed out so much better for photography, the bigger screen is amazing. Yesterday I braved the weather once again to go into the city to see an exhibition at the art gallery but stopped off in Leederville to check out the latest murals painted for FormPUBLIC 2015. The flowing hair, although not as red, reminded me of a certain someone :) Looking fabulous in a lane-way off Oxford Street it was created by Perth artist Sarah McClosky. Looking a little further up the lane you might recognize the bouffant quiffs and segmented style of Martin E Wills you've seen his work many times here before..
... and last but definitely not least directly opposite this huge scale work by Robert Jenkins check out the rather mesmerizing details. It's a little hard to keep up with all the incredible new street art in Perth, but believe me I'll try :) Happy Tuesday, take care and stay safe..
No ships in the slips or, into the brink & over the edge! You may have noticed I've not been around much over the weekend, here's why! The decision was made (?) to upgrade my computer from a lap top to a desk top. OMG! As far as technology goes I do not like change, I get the hang of things and I like them to stay exactly as is and oh my lordy how things have changed :) From the keyboard layout, so excuse any typing errors, to the fact that I can't just slip my SD card into a slot to download my pics, now I need a connection.. pfffft! Bear with me, poor P how he's managed to stay sane with my overreactions to everything is a miracle, I will get used to it I think I'm sure. Do you lap top or desk top? ...and this is where the second part of the title comes in. To clear my head I braved the weather to take some shots of ... the weather! At times the gusts were so strong they almost picked me up and over the edge.. and not a ship in the slips, would have been crazy to head out to sea in a small boat in this weather. Hope you've had a much calmer weekend, inside and out, than I have. Happy Monday, take care and stay safe. p.s. big catch up today! The parterre garden behind the south tower of the Bishops See on the corner of St. Georges Terrace and Mount St. does have that secret garden feel. Behind the imposing entrance to the south tower off the terrace and surrounded by skyscrapers, it's possible that apart from the workers in the surrounding offices, Perthites might not be aware that it's there, certainly Aimee, who has worked in the city for over ten years was surprised when I mentioned it! I have shown this very pretty garden before, but couldn't resist another visit last weekend.. shaded by surrounding highrise the large fragrant flowers of the immaculately trimmed Camellia hedges flourish, the sight and scent a delight! Looks like storms and rain for our weekend here in Perth, bit of a shame as there are so many big outdoor events planned, will have to see how that works out! Happy weekend, take care and stay safe..
Muchas gracias Sr. Curiot.. Mexican magic! Broken Hill Hotel.. shades of beige. Flouncy dresses and the 'Seven Year Itch'..
Mid-autumn blues.. and silver linings! Croque Madame with Mrs S..